Orange and black became the official colors of Princeton University in the late 1800's honoring William III of the House of Nassau, the Prince of Orange. The choice was also an intended snub directed toward Rutgers' belated attempt to adopt those very same colors. In short order, the tiger was installed as Princeton's totem because the large, striped wildcat shared identifying colors with the university and because the word "tiger" appeared in an oft-heard pep rally cheer on its fields of contest: "Hip hip, rah rah rah, tiger tiger tiger, sis sis sis, boom boom boom, ah!" 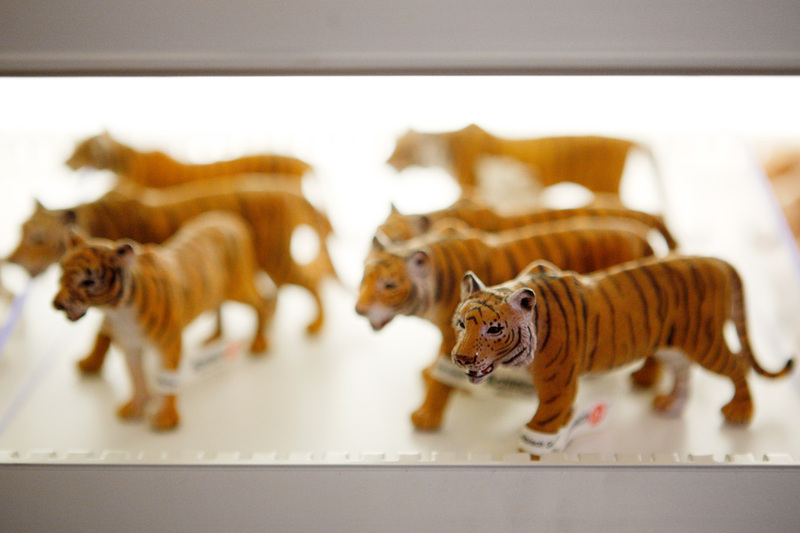 These beautiful miniature tigers pace the shelf at jaZams, a wondrous toy store at 25 Palmer Square East. Give yourself plenty of time if you visit jaZams, because you won't want to leave! You'll find scores of brain-taxing puzzles and games, a large selection of kid-friendly musical instruments, and a fun reprise of real wooden toys that our grandparents would find familiar.